Envision Tomorrow (ET) is an open-access scenario planning package that allows users analyze how their community’s current growth pattern and future decisions impacting growth will impact a range of measures from public health, fiscal resiliency and environmental sustainability. The original planning tool was developed by Fregonese Associates of Portland, Oregon, who are still key users, developers, and innovators. Recent improvements to the tool are the product of a close collaboration between the Metropolitan Research Center (MRC) and Fregonese Associates. These improvements consist of approximately 20 additional analysis tools and scenario indicators developed and incorportaed into the standard Envision Tomorrow tools and indicators as part of the Sustainable Communities grant process. Most of the additional models are based on cutting-edge empirical research conducted at the MRC lead by Dr. Arthur “Chris” Nelson and Dr. Reid Ewing. The main idea behind this project is to make online scenario planning available to a much larger number of people. This package includes both analysis tools and scenario design tools. 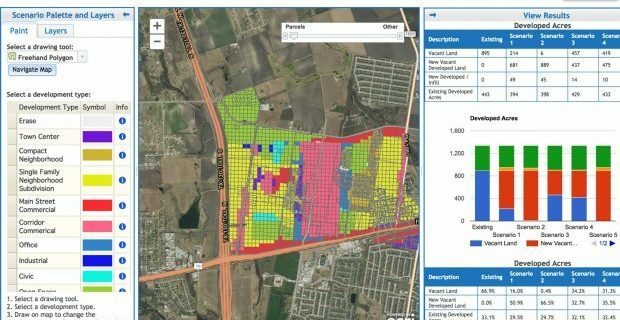 The analysis tools allow users to analyze aspects of their current community using commonly accessible GIS data, such as tax assessor parcel data and Census data. The scenario tool allows users to “paint” alternative future development scenarios on the landscape, and compare scenario outcomes in real time.